6. Testo premazati sa 2 kašike otopljenog putera. Posuti cimet i šećer, po želji i grožđice. 10. Savet : za bolji ukus rolnica, nakon što ih prelijete sosom, stavite ih u kutiju i poklopite, nekih sat vremena pre služenja. 1. Heat the oven on 250’C. 3. Add butter to flour mixture, until you get crumbly texture. Add buttermilk and mix until you get ball from dough. 5. Spread melted butter on the dough. Sprinkle cinnamon and sugar. If you like, add raisins. 6. Make a roll, and cut pieces about 4 cm thick. 7. Put rolls on baking paper on the pan. Bake until they get nice golden colour (about 10 minutes). 8. While rolls are baking, prepare sauce : combine sugar, buttermilk, vanilla and butter – heat until well combined and get smooth texture. Modify thickness with adding more buttermilk. 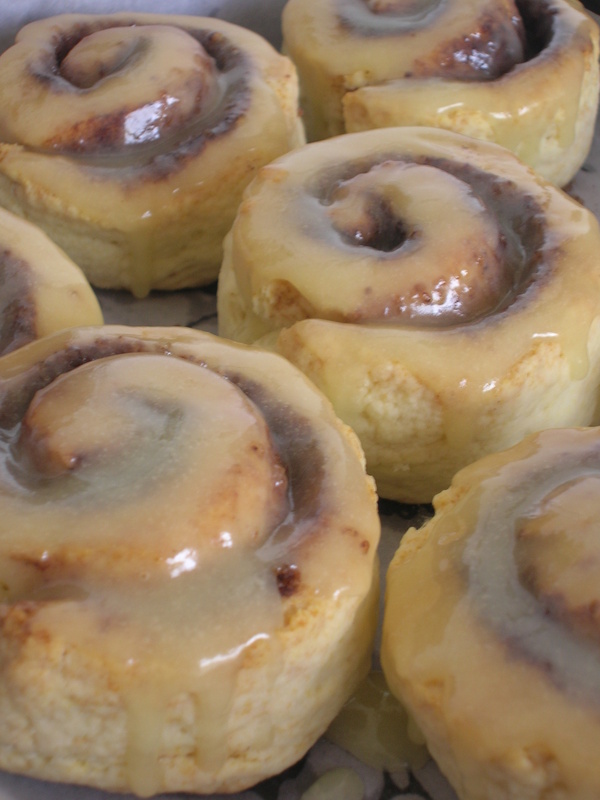 Spread over rolls when they come out of the oven. 9. Tip : for better taste, put rolls in container with lid and cover for about an hour before serving. Posted in Slatkiši / Sweets and tagged cimet, cinnamon, cocoa, kakao, preliv, rolnice, sauce, sweet. Bookmark the permalink.